The term wind chill goes back to the Antarctic explorer Paul A. Siple, who coined it in a study: "Adaptation of the Explorer to the Climate of Antarctica". The wind chill factor or equivalent temperature uses a neutral skin temperature of 33 °C as a baseline value, so only two parameters remain . Definition: Wind chill accounts for loss of heat when warm air around a body is replaced with colder air. The factor is an indication of the effect of the combination of air temperature and wind speed on human comfort and safety. the threat of hypothermia can be anticipated by using the factor. Indeed, the wind chill factor is a highly underrated tool to prevent hypothermia and frostbite on board! Forecasts made with these equations are reasonably sufficient, though work is being done at this very moment to obtain a better index or factor. there's no heat being generated in a water filled object, whereas the human body is constantly generating heat. the original experiment uses wind speed at 10 metres above ground. the equations are not valid above 40 knots and below 5 knots! 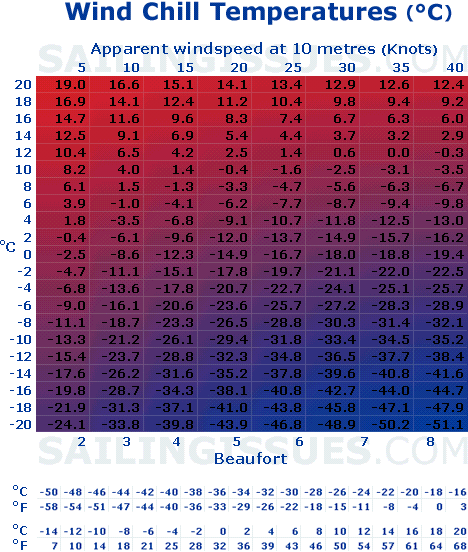 Conclusion: For your safety - even when sailing in the warmer waters of Greece or Turkey: anticipate and use the equivalent temperature to adequately forecast wind chill.